Auto Corrosion is the corrosion of a so-called pure metal such as bronze, brass, aluminum, etc. It can also be observed on the surfaces of "stainless steel". In theory, a pure metal does not corrode. If you had a 100% pure bronze propeller for example, it would be safe of corrosion unless it came in direct contact with another metal. However, in reality, no metal is pure; there are always impurities abound. Your bronze prop could also contain plenty of iron, especially if you bought a cheap one! When this "impure" mixture is exposed to the elements, the result is Auto Corrosion. So what's happening? On a molecular level, on the surface of an unpure metal, two dissimilar metals are in direct contact. Due to their inherent properties, one of these metals is less corrosion-resistant than the other; this metal will be the one that will be suspectible to corrosion. However, corrosion will only take place after the introduction of an electrolyte; a substance which is electrically conductive - such as seawater or even freshwater (essentially any liquid that contains salts, acids or bases). By adding an electrolyte to these two dissimilar metals, suddenly electrons start flowing from one metal to the other. In other words, you've built a tiny battery! Unfortunately, the resulting electrical current of your new "battery" will cause one metal to start breaking down, specifically the less-resistant metal. This disintegration is observed as rust. Let's not even consider coating your ship's bell with rust paint! There are two ways of dealing with auto corrosion; either strip it off or passivate it. Various metal cleaners will clean and wax many types of metal. 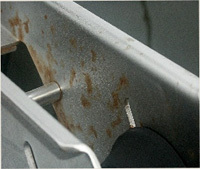 This is the cost effective way of dealing with most rust issues on decorative metal. It's not a particularly long term solution nor will it address structural issues. However for bells, ornaments, lamps and other non-integral metal, it can be a rewarding job to renew your bronze with a good cleaner/wax! For stainless hardware, consider re-passivation. This method implies that you will use a phosphoric acid to convert the rust/oxidation into a layer of hard, non-reactive, oxidized material which is less vulnerable to future corrosion. Aqua-Tek Aluma Brite Cleaner Acid wash Aluminum and metal hulls Also removes organic matter. Economical. Flitz Polish Concentrated paste Brass, Copper, Sterling, Chrome, Stainless Steel, Nickel, Bronze, Anodized Aluminum Protects up 6 months in freshwater, 3 months salt water environments. MAAS Metal Polish Concentrated paste All metals, Fiberglass, Plexiglas, Eisenglass, mirrors, clouded glass & crystal, ceramics, etc Great in the household as well as boat. Collinite's Metal Wax Liquid wax with Carnauba Chrome, aluminum, copper, brass and stainless steel Economical. Requires plenty of rubbing! Peek Polish Concentrated paste All metals and fibreglass. Acid-free, can be buffed. Spotless Stainless Iron removal & leaves layer of Chromium oxide Stainless Steel Specifically designed for harsh environments - iron removal and Chromium oxide layer prevent future rust! Wichard Wichinox Repassivation Stainless Steel Expensive but powerful cleaner. Repassivates surface with phosphoric acid.